Emanuel Leutze had a thing for Columbus. Before painting the famous Washington Crossing the Delaware (an iconic work of American nationalism painted somewhat ironically by a German artist), Leutze painted at least six pieces centered around Christopher Columbus, which is, I don’t know, kind of a lot. History painters be painting history, I guess. 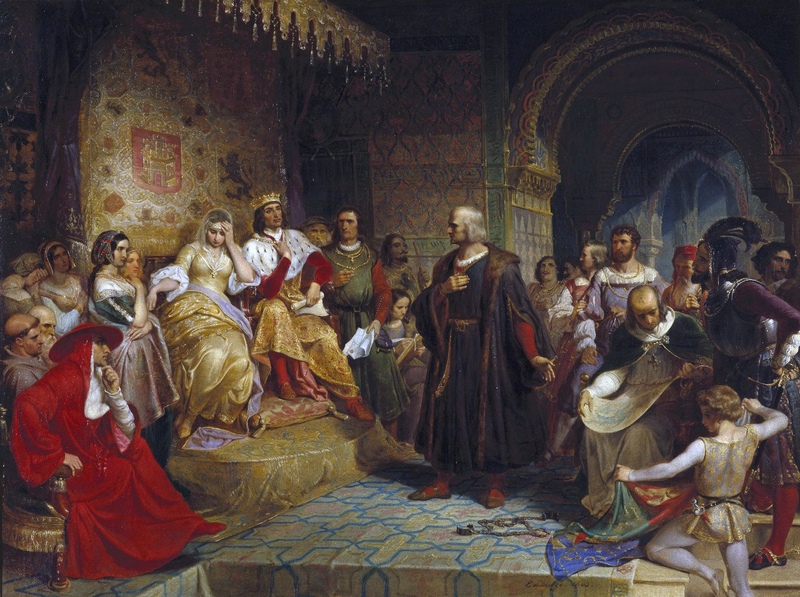 The Brooklyn Museum (where Columbus before the Queen is kept) describes Columbus in the painting portrayed as “a hero” who “boldly addresses” the Spanish King Ferdinand and Queen Isabella while commanding the attention of the entire room. To be honest, I’m not sure we’re looking at the same painting here. Sure, the dude is in the center of the frame, but the distance he has between everyone else says less about his authority and more about everyone else’s total embarrassment over being in the same room with him (cue Isabella’s epic facepalm and Ferdinand awkwardly avoiding eye contact). On top of all that uncomfortableness, those prison shackles by Columbus’s feet don’t scream “hero” to me. After doing some digging, it seems likely the historical moment Leutze depicts here takes place after Columbus’s third voyage to the New World (less and less new each time, I suppose). By now, a lot of eager colonists that were once willing to join Columbus on these escapades find themselves less charmed by the whole proposition (probably because of all the death, disease, and violent pillaging), so the Italian explorer sought the help of convicts to make up his new crew. This is akin, we might say, to pouring gasoline over a fire. Obviously, things went poorly. Columbus took six ships, three of which headed straight for Hispaniola, a large island in the Caribbean. The other three, including the one Columbus was on, took their time exploring the Indies, looking for more civilizations to ruin—erm, I mean “discover,” sorry. When he finally met up with the other colonists in Hispaniola, they had planned a revolt against him because there wasn’t enough gold where they were staying or maybe just because he had taken so long to get there. Either way, things went bad fast. Eventually Isabella and Ferdinand heard about the whole revolt thing and had their beloved explorer brought back in shackles for being unable to control himself and his unsurprisingly rebellious convict shipmates. Suffice to say, it was very embarrassing for all involved. Although Columbus was able to eventually talk himself out of his shackles (see painting), nobody was really happy about it. Hero? More like that weird nephew at a holiday party nobody wants to talk to. Strangely enough, Leutze decided this uncomfortable moment was indeed one for the ages.